With a versatile 1-2 bedroom set up, Bailey's sleeps 4 people comfortably and can easily work as a 1 or 2 bedroom unit. The roomy main bedroom has a double bed, loveseat, and writing desk. The living room (with TV/DVD and full-size sleep sofa) can easily function as a second bedroom. Bailey's Beach House is a cozy, cheerful cottage with direct access to a secluded beach right on the Bay. It's like a postcard from Cape Cod every day, the perfect getaway, with spectacular sunsets, viewed from a common-use deck. Feel the peace and the history of the Cape, as you swim in the sparkling Bay waters, or take long walks along the shore, gathering shells and watching seabirds dine al fresco. It's fabulous in season but even more private and economical in June and September before and after the summer bustle, when you can feel the calming effects of the beach, yet are only a few minutes drive from restaurants, shopping and sightseeing. Dining room seats 4 and can also serve as a sitting/living area. Modern bathroom and galley style kitchen. Sunny private-use deck in front and secluded backyard patio with lounge chairs, patio table & charcoal grill. Private outdoor shower. Parking for 2 cars. 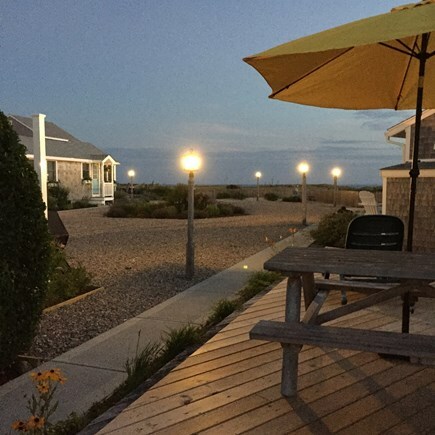 Within a few miles, enjoy the shopping, dining, galleries, boat rides and nightlife of Provincetown; a winery; Highland Golf Course and Lighthouse; ocean side beaches and hiking/biking trails. Just a little further up Route 6 you’ll find a weekend flea market and drive-in movie theater. 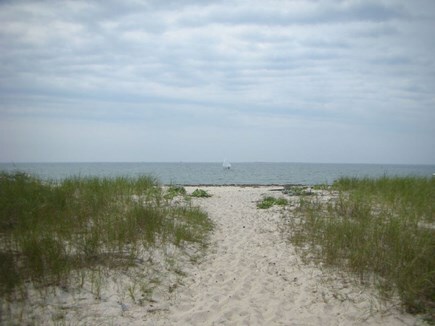 Or, leave your car in our parking area and hop the shuttle bus to P-Town that stops directly across from the cottage every 20 minutes or so in the summer’s high season. Additional pricing info: Plus $100 refundable cleaning/damage deposit. State and local taxes of 12.45% will apply. This cottage is so adorable! Just loved it, sitting out on the deck in the morning having my coffee overlooking the ocean. Great location and sunsets! Enjoyed the outside shower! Perfect little cottage if you want a base to visit Cape Cod region and go to the beach. Neighbors were really friendly (you can say that about everyone we meet during our vacation) and helpful. Ideal for two persons, can accommodate four adults but you have to be comfortable in being a little tight. Ideal for a family with one or two children. Owners were helpful and easily reachable in the weeks and months prior to our vacation. Highly recommended. We love this cottage. If you want to roll out of bed and take a walk on the beach this is the place to stay. 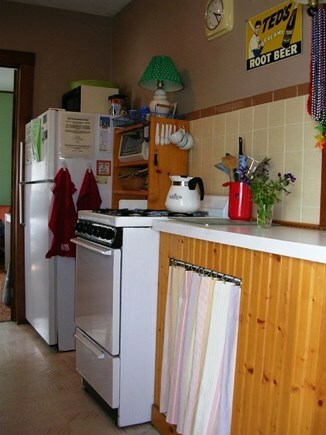 The cottage is well equipped, clean and very roomy. The bonus is an outdoor patio out front and out back, and an outdoor shower! 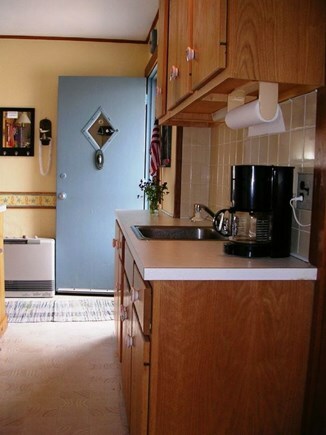 The price is right, the neighbors friendly and you are very close to Provincetown. Beautiful location. 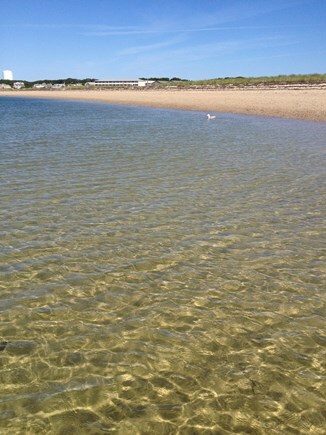 Right on the bay and easy access to the shuttle to Provincetown. Cottage has everything you need. This was our 7th (?) summer here. Bailey's Beach House, named for our beloved chocolate lab, was purchased in 1999. Ownership has been maintained within our family ever since. 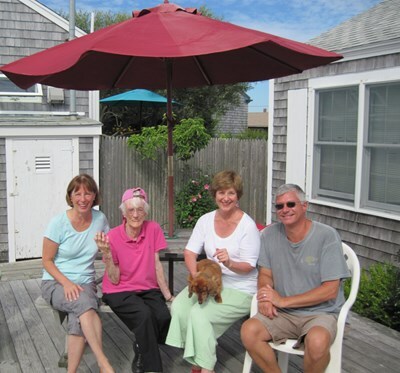 Some of our favorite family memories include time relaxing with our mom who recently passed away at the age of 94. We are grateful to have those memories to look back on and are delighted to share the space with other friends and families to create their own memories.